4/21/2016: Walking into the all-day window workshop in Darmstadt, Germany this morning, I found myself thinking about John the Baptist and the voice crying in the wilderness. John was the rough-hewn harbinger, and so are the men and women of Passivhaus. They see themselves as pioneers. Their office and demonstration center–in this city where the world’s first Passive House was built 25 years ago–is aptly rough-hewn. I am sure they sometimes feel like a voice crying in the wilderness, but they are a happy lot, doing the right thing. Our job is to bring them and their rigorous standards off the frontier and into the mainstream. The Passivhaus workroom is simple, with some long tables and chairs, a PowerPoint screen, and 3 or 4 ventilation systems set up for demonstrations. One of the 5 or 6 core principles of the Passive House standard is “heat recovery” or “energy recovery” ventilation. Buildings use a huge chunk of all the energy consumed in the world, and in climates like New York’s, heating buildings burns more energy than cooling them does. Passive Houses are constantly being refreshed by filtered outside air, because comfort and health (not to mention affordability—see a future installment called “You Only Need 1 Small Air Conditioner, not 5 or 10 Big Ones”) are a central feature of them. So ventilation is key, but it would be a huge waste to dump heated air into the atmosphere in the winter. Admittedly many New Yorkers open their windows when the steam heat is cranked on, but one thing at a time… So the air that is being extracted or exhausted out is run through a machine where it passes by the cold air coming in. This machine is called an ERV or HRV (= Energy or Heat Recovery Ventilator). The heat from your outgoing air, according to the laws of thermodynamics, jumps over to the cool incoming air because heat seeks out that which is cooler. So the outside air is warmed up by the time it comes in, and only a little of the heat energy is blown outside. In the summer time, this process can be flipped around so that your icy air conditioned air takes some of the heat out of the incoming summer heatwave air before it is allowed in. One of our hosts pointed to the big HRV on the wall and said, “that’s the noisy one”; it was inaudible. These guys are serious. 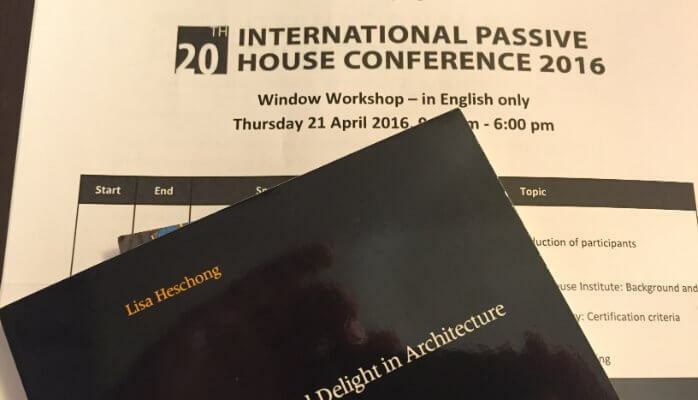 Another core principle of Passive House is great windows, hence the workshop. Windows are a fascinating problem, and the 8 hours flew by. What I learned is this: windows are the weak point in any building envelope (the outside shell of a building). Interestingly, the worst parts of a high-performance window from an energy standpoint are the frame and the edge of the glass, not the glass itself. For those who live in cold winter climates, you have noticed that you get uncomfortable standing next to windows even if it is warm enough inside. That’s because the glass is significantly colder than the indoor air, and your body heat actually radiates toward the cool glass due to the aforesaid law. In her enlightening book Thermal Delight in Architecture, Lisa Herschong writes that we have a special thermal sense inside us that can pick up very small fluctuations in temperature. She describes an experiment in which people in the middle of a room were able to pick up a 9 degree change in one of the far walls. Passive House standards require high-performance, usually triple-glazed windows that eliminate this discomfort because the inside pane of glass is the same temperature as the air in the room. A little story illustrates why I chose to do an all day window workshop instead of something sexier like “Deep Energy Retrofits”. Believe it or not, the following is just a typical example, not an anomaly. This past March, I arranged in situ testing of some brand new custom wood windows in a gorgeously renovated Park Avenue pre-war apartment. The owners sensed that cold air was blowing in through their toddler’s bedroom window in the winter months. Building envelope specialist Mario Goncalves of CLEB out of Quebec installed a blower door to pressurize the room, had his associate start up the smoke machine, and positioned himself in an adjacent room to observe. On the video you hear him blurt out “Oh, S__t!” as smoke billows out of the closed window—possibly between the window and the window opening. And there is no way this issue is unique at all! Houston, we have a problem. We drill the ocean floors and the deserts and the plains and frack the countryside to make the boilers go, the boilers burn the fossil fuel to create steam, the steam travels up the steam pipes to the radiators, and the heat goes out the gaps between the brand new window and the window opening no one thought to seal properly, heating up the little bit of atmosphere outside the boy’s room. You might as well just drill the oil and pour it out, or let the fracked gas escape into the air. Why go to all the inconvenience of sending it through pipes to burn in furnaces? Houston??? Are you there, Houston?? Cutting back to Darmstadt today, the workshop was sold out with a waiting list. Of the twenty or so participants, I was the only American. There were people from Spain, Germany, Austria, Canada, China, Japan, Norway and Australia in attendance. Dr. Benjamin Krick and “the crazy passive house window guy” Franz Freundorfer did a great job presenting all day in English. Their knowledge was matched by their love of the subject and yes, sometimes crazy sense of humor. Franz’s father and grandfather built windows, and he appreciates their aesthetic as well as all of the technological advances that are making them better insulators. He feels that windows are passing out of their “ugly phase” to become beautiful again, which makes him glad since they are “the eyes of the house.” A great prelude to the conference itself, and a hopeful harbinger for the shivering little boy in his crib in Manhattan.